Study abroad provides opportunities that students cannot find at home, and these possibilities continue to grow in KNR! Ten students along with Amy Hurd and Barbara Schlatter traveled to Mendoza, Argentina, over spring break to visit Maza University and the National University of Cuyo, where they were experienced university life in Argentina. They visited Terrazas, Trapiche, and Tomasso Bodegas (wineries) in the Cuyo region and enjoyed rafting and zip lining in the Andes Mountains. In May, 10 students from the School of Kinesiology and Recreation and the Department of Health Sciences traveled to Poland to participate in a two-week cultural immersion experience with colleagues from Opole University of Technology in Poland. Deb Garrahy and Daphyne Walker led the group as they visited classes, experienced outdoor recreation, and visited the cities of Krakow and Wroclaw, Poland. Students spent a reflective afternoon at the Memorial Museum at Auschwitz-Birkenau, and enjoyed new friendships with their Polish hosts. 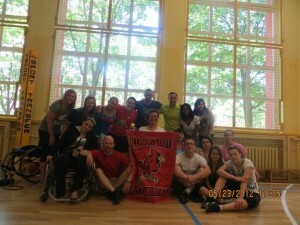 This was the School of Kinesiology and Recreation’s third student-centered trip to Poland. Both the trip to Poland and to Argentina was part of the College of Applied Science and Technology’s Global Initiative. This fall new semester-long study abroad programs will commence between KNR and the University of Limerick, Ireland. Four physical education teacher education students will spend the fall semester at the University of Limerick while several Limerick students will travel to Illinois State for their studies. In the spring, exchanges will occur between exercise science students from both universities. The school is proud to advance international education by providing students with first-hand experiences in global affairs and cross-cultural activities.